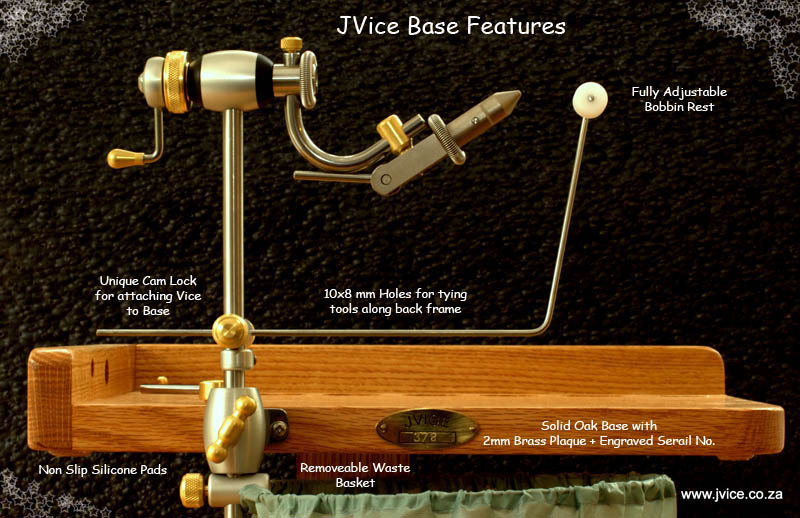 Each Jvice is made by myself from start to finish from high grade bar stock components. The stainless steel used for the stem, GooseNeck, jaw screw, crank and levers is 316 while the stainless steel used for the bobbin rest and laser cut plates is 304. All Aluminium components are turned from 6082 bar stock aluminium and then Type II anodised and dyed to the required finish colour..
All the brass knobs, adaptors and thumb screws are machined from extruded solid brass bar stock. The load bearing bushes on either side of the main housing are precision machined from Ertalyte round bar. This material is used in industry for heavy machine bearings and bushes, it is extremely durable, self lubricating and does not absorb moisture. These bushes combined with the superfine thread on the large thumbscrew ensure the extremely smooth rotation and rotary tension adjustment. 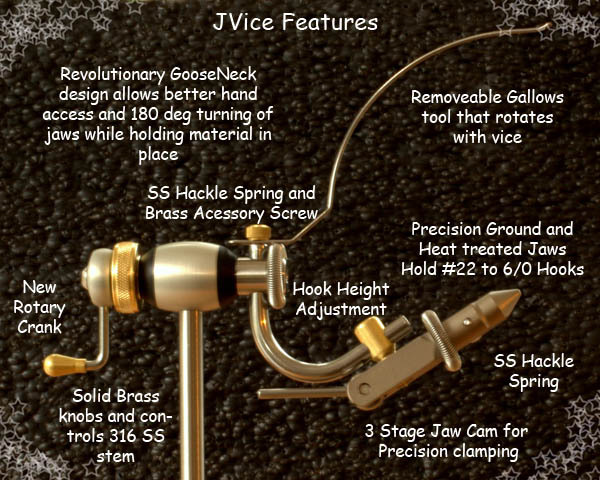 The revolutionary GooseNeck design allows excellent hook access (normally only found on non rotary vices) for tying in and placing of tail and other materials. While holding the material in place on the hook shank the vice head can be rotated about 40 degrees either way with a simple twist of the wrist. This feature is very useful when making those first few critical wraps. The vice stem clamps into the base using a unique quick release brass cam adaptor The brass cam also secures the extension arm to the front of the base. There is a hex plate, which when engaged, locks the vice stem in the vertical. By disengaging the extension arm from the plate the vice stem can be swiveled right or left, This feature is useful when setting epoxy as the flow can be controlled by rotating the crank and moving the vice stem back and forth as required. The standard bases are made from imported American Oak and treated with Woodock10. This clear, lead-free indoor wood sealer, with nontoxic preservative and anti-fungal properties is formaldehyde free. For maintenance just oil with any good furniture oil. Bases can also be custom made from any available commercial hardwood. I have made bases from Kiaat, Panga Panga, Hard Pear, African Rosewood and various other African Hardwoods. These are not always readily available and can add about 3 weeks to order schedules. I originally designed the base to fit in a spare laptop bag I had available. This was ideal to house the Jvice as the document compartment held most of my capes and other materials in A4 zip lock folders. There were also many nooks and crannies for housing tying tools. Unfortunately laptop bags are expensive so I commissioned a local manufacturer to produce the padded bag currently supplied with the Jvice kit. This has a padded interior flap with elastic loops for storing tying tools.